20/09/2013 Anyone who witnessed the infamous Miley Cyrus performance at the MTV Video Music Awards will be familiar with "twerking", a sexually charged dance move that probably originated in the 1990s as “an alteration of work” according to Oxford Dictionary. While the term may have been around for a long time, however, it took the social media frenzy surrounding Miley Cyrus for Oxford to take notice. "Derp" is another expression directly from social media, a term used as a substitute for vacant, meaningless, or stupid. 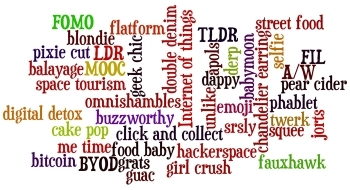 Technology has always been a catalyst for language, with some new additions including MOOC (massive open online course), bitcoin, digital detox, and hackerspace. While computers continue to influence the modern tongue, however, a number of recent additions also came from the fast-moving fields of gastronomy and fashion. Cake pops, blondies, pear cider, and food baby were all included; as were double denim, geek chic, and pixie cut. "Jorts" is one new word getting its fair share of attention, a term used to define denim cutoff shorts for men. According to Oxford Dictionaries, new words are added through the Oxford English Corpus and Oxford Reading Programme, with Corpus words sourced largely from the Internet and Reading Programme words coming from a variety of other sources. While some commentators have criticised the inclusion of fashionable words, the criteria used by Oxford has changed to meet the needs of the digital age. Not only is evidence of use an important requirement for inclusion, but the timeline period of use has also been reduced. According to Oxford, "It used to be the case that a new term had to be used over a period of two or three years before we could consider adding it to a print dictionary. In today's digital age, the situation has changed. New terms can achieve enormous currency with a wide audience in a much shorter space of time, and people expect to find these new 'high-profile' words in their dictionaries."